Competitive first-person shooters operate on all sorts of sets of unspoken rules. Teams should be, more or less, evenly powered. Opponents should die occasionally. Everyone should be visible—at least, most of the time. 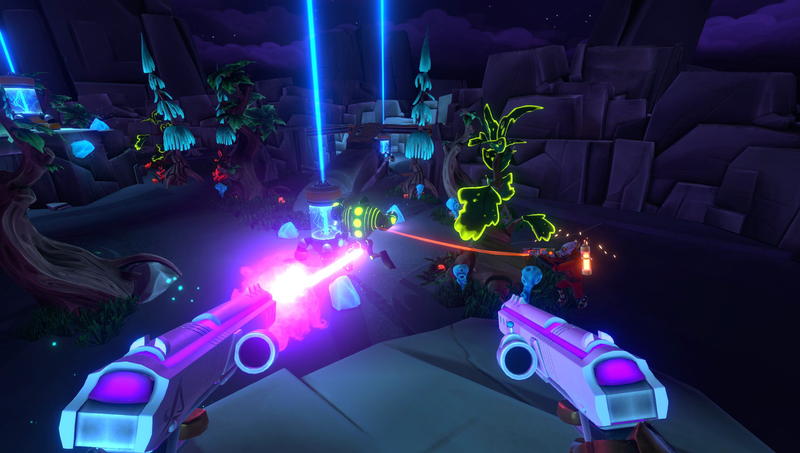 Aftercharge aims to break those rules. I got to play a few rounds of an early PC build of Aftercharge during “The Mix, ” an indie showcase near E3. In it, two teams of three battle over energy extractors. The robot team wants to sabotage them (with punches), and the enforcer team tries to down all the robots before they can. Now here’s where things get weird: the robot team is, by default, invisible. They can only be seen when they’ve recently been hit or an enforcer is tracking them with a special beam from their gun. Also, as long as one robot is still alive, they need only get close to their comrades to revive them if they go down. The enforcers, on the other hand, can’t go down. Robots can knock them away, but they’re functionally invincible otherwise. They can flush out the robots with an arsenal of guns, grenades, and even airstrikes. It might sound like a lopsided dynamic, but in practice, it leads to frantic fun. The robots sneak, strategize, and work as a team, while the enforcers react with sudden, angry lightning bolts of violence. On the robot team, I found it effective for one person to distract the enforcers while another pounded on an extractor as a second distraction to divide up the enforcers, while a third surfaced shortly after to actually try and destroy a generator. The best enforcer strategy I saw, meanwhile, involved slowly pushing downed robots to places the other robots—even while invisible—would have trouble reaching. Aftercharge isn’t set to come out until next year, and as of now, it only has two character classes per team. It’s already an inventive game, though. In a sea of multiplayer shooters, it stands out. I’m looking forward to seeing what it evolves into.